Anyway, I thought I would share my red pots. Not only are they pretty but the work really well too. Oh and here's another little dress I made for a Haitian baby, it has red too. Nice pots and the dress is just so adorable. A little bit of cheer for a place that has had so much devastation. You are so generous. I don't think I've ever thought of a pot or pan as beautiful until I saw yours! And how kind of you to make dresses for the Haitian babies. You obviously have a big heart! Those pots are wonderful! I love the red! Wow! What super red post you have there Grams ... all the better cook with I bet! LOL!! And just look at that wee dress, how sweet it is and how kind of you. Looks like you have great taste in both pots and fabric with lots of talent and heart to boot. Great pots, love their bottoms! What a wonderful gesture to make babies clothing for Haiti. Just adore those pots!! How cute! I love your red pots. I have never seen any like them. How very compassionate of you to make the dress for the Haitian baby. It's beautiful and I know it'll be very much appreciated. I have never seen pots like that.Did you make them or buy them that way. They are so cool and perfect for hanging. That little dress is just to cute. That is so nice of you, I know a little girl would love to wear it. I love your red pots! Your dress came out adorable, I am sure it will put a smile on some little girl's face! Your red pots are great! Your little dress with the red touches is so very cute. How sweet of you to take the time to make it and to bring a smile to a little one's face. How good and kind of you to make that little dress. I am sure it will be so appreciated. LOve your red pots and pans!!! Cute dress! Oh, I am sorry a little got hurt! Me, oh, my! I have lots of boy gran babes to! Ouch! 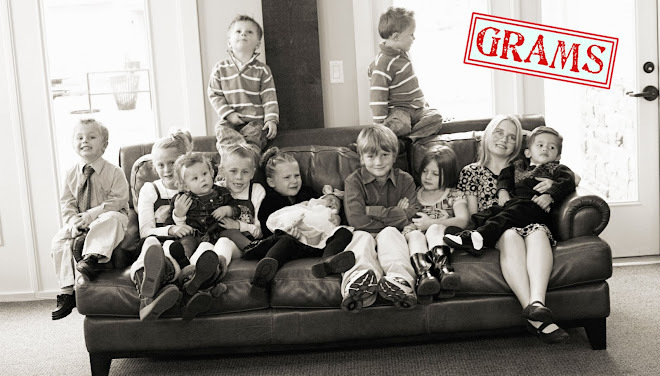 Love the new grandchildren picture!!! Oh I love your sweet red pots!! How fun it would be to cook dinner in those :) But I especially love that adorable little dress for a baby in Haiti. The colors are so bright and cheerful. I am sure it will be a special blessing to that sweet little girl that will receive it. I have never seen anything like those pots before! How fun! And that sweet little dress....too cute! Very beautiful red pots, adorable dress !